A 12-year-old boy, Sukhdev Muni, who was kidnapped yesterday from Moga, was found unconscious in the room of a hotel situated on the Nehru Garden-Railway road in Jalandhar today. Former Health Minister and senior BJP leader Laxmi Kanta Chawla today joined the protest against alleged police inaction in the two-week-old "abduction" case of a minor girl. Thanks to a Pakistani theatre troupe's participation in Baba Farid Festival here, Kasif Ali, a 13-year-old Pakistani boy languishing in a juvenile home for the past 11 months, was today reunited with his widowed mother at the Wagah border. Notwithstanding measures claimed to have been undertaken by the administration to check illegal mining of sand, the process continues unabated Ferozepur. So much so that till date, the Industry Department claims to have recommended registration of cases against 36 land owners, besides issuing over 40 challans against erring persons owing allegiance to the sand mafia. Still, the process is allegedly going on in a clandestine manner allegedly under the patronage of the authorities concerned. With four more gastroenteritis deaths today, the toll in this industrial town has risen to 10 even as officials are working round the clock to check the spread of the infection. Those who died at the Civil Hospital here today have been identified as Parkasho, Birbal, Som Nath and Tara Devi. A migrant labourer from Bihar died of diarrhoea while 40 more patients suffering from gastroenteritis were admitted to the district hospital here today.The disease has spread to the new grain market. Dr Naresh Gupta, Additional Civil Surgeon, said that Vinod Kumar (45), working in the grain market here, was brought dead to the hospital. Training guns at former Minister Gulzar Singh Ranike, the Congress today demanded a high-level inquiry into the alleged embezzlement of funds in his home constituency either by a national agency, a sitting judge or a joint committee of the Vidhan Sabha. The Punjab Vigilance Bureau has given a clean chit to Ranike in the case. The Punjab Congress Legal Cell today urged Congress general secretary Rahul Gandhi to intervene and provide help to improve the deteriorating condition of government schools in the state. Seeking the intervention of Union Railways Minister CP Joshi, Punjab Chief Minister Parkash Singh Badal today urged him to immediately start a Shatabdi Express train on the Bathinda-Delhi route via Jakhal-Rohtak to facilitate the people of the Malwa belt. In a letter to Joshi, the Chief Minister apprised him of the commissioning of Guru Gobind Singh Oil Refinery in Bathinda, following which the city had emerged as a petrochemical hub. The Shiromani Akali Dal (SAD) today condemned the Delhi Government’s decision to amend the Delhi Sikh Gurdwara Act, 1971, increasing the tenure of the Delhi Sikh Gurdwara Management Committee (DSGMC) House from the existing two to four years and proposing direct election to the post of its president. Shocked at the recovery of 105 kg of heroin in the rail cargo from Pakistan yesterday, Indian traders today demanded a probe by a Central agency into the matter which, they said, posed a threat to bilateral trade. Rattled by allegations of embezzlement of government funds, the state government has decided that beginning November 1, funds will be deposited directly into the accounts of either the beneficiaries or the executing agency. Three police officers with the Crime Investigating Agency (CIA) at Patran, Sub-Inspector (SI) Jarnail Singh, Assistant SI Ajaib Singh and munshi Gian Singh, were suspended for dereliction of duty today after three drug peddlers escaped from their police cell yesterday, carrying with them their crime file. To promote the sale of articles prepared by artists belonging to the economically weaker sections, the city will host the 12-day Sale of Articles by Rural Artisans' Society (SARAS) mela from October 11. Nearly 190 marriage palaces in Jalandhar, Kapurthala, Hoshiarpur and Nawanshahr districts have been operating without obtaining mandatory clearances from the Punjab Pollution Control Board (PPCB). Punjab Government has drafted a policy for existing marriage palaces in the state. Deputy Chief Minister Sukhbir Singh Badal today informed the development to a delegation of marriage palace owners. Traders and industrialists of Mandi Gobindgarh today called off their protest against the e-billing and e-trip system after a meeting with Deputy Chief Minister Sukhbir Badal in Chandigarh. The General House of the Municipal Corporation Bathinda (MCB) yesterday passed a resolution declaring that building plans in the areas designated as "developed" will be passed — a move that may draw flak from the Punjab and Haryana High Court. Students of a private school along with several residents of six villages blocked the Bathinda-Dabwali highway for over four hours seeking immediate closure of a distillery that was opened in the village two months ago. Greenhouse farming has failed to take off in the district as only 12,000 sq m area has been covered under it till date despite 50 per cent subsidy provided by the state government under the National Horticulture Mission. Information from the Horticulture Department reveals only 12 greenhouse farms have been set up in various villages in the district. “It is surprising that Punjab does not have any education Act to regulate the school education sector, including functioning of private schools,” observed Punjab and Haryana High Court Chief Justice AK Sikri while hearing petitions concerning enhancement of fee and other alleged malpractices adopted by private unaided and recongnised schools in the region. The Supreme Court today dismissed a Punjab Government’s appeal against the Punjab and Haryana High Court verdict quashing the re-auction of liquor vends in Hoshiarpur, Jalandhar and Nawanshahr held on November 5, 2004. Acting on a civil writ petition filed by Dr Robert James, an assistant professor and a former hostel warden of Christian Medical College and Hospital (CMCH), the Punjab and Haryana High Court has issued notices to Principal Dr SM Bhatti and Director Dr AG Thomas to appear before the court in person on November 2, and file a reply to the petition three days before the next date of hearing either in person or a duly instructed advocate. Taking cognisance of a public interest litigation (PIL) seeking action against senior Punjab IAS officer Sucha Ram Ladhar for allegedly retaining the amount charged for arbitration instead of depositing the same with the government, the Punjab and Haryana High Court today directed the Union and state governments as well as the officer concerned to file their responses on the issue. A local court today sent Gurcharan Singh, Assistant Commissioner of Police (ACP), Ludhiana, who was arrested in a bribery case, to judicial custody till October 19. The Rajpura city police today claimed to have busted an inter-state gang of vehicle thieves. The police said the gang had stolen more than 40 vehicles from various places in Punjab and Haryana and sold them to scrap dealers after dismantling them. Moga Superintendent of Police Satpal Singh Bhangu claimed that the kidnappers belonged to Ludhiana and will be arrested soon. A student of Arya Public Model School, the victim was returning home from school on Monday when he was stopped on the way allegedly by Ashwani Kumar, alias Ashu. In his statement to the police, the boy claimed that Ashu took him on his motorcycle and the two reportedly roamed on the city roads for a couple of hours. He was then served a Chinese dish at a food joint near the bus stand, following which he fell unconscious. When he woke up in the morning, he found himself in a room of the hotel. Bhangu said when the victim tried to enter the room's washroom, Ashu tried to strangulate him and the he again fell unconscious. A few hotel employees noticed the incident and informed the Jalandhar police. But, the accused managed to escape till the police arrived. Strained business ties between Ashu and the victim's father, Varinder Jaidka, were stated to be the reason behind the abduction. Ashu was into dairy business whereas Jaidka, who owned milch cattle, used to supply milk to him. The supply, however, was stopped after Ashu was caught selling synthetic milk. Suspecting that Jaidka may have tipped off the police, Ashu planned to take revenge on the victim's family. Deputy Superintendent of Police Gurvinder Singh Sangha said, "Ashu may have kidnapped Muni to settle scores with his father." 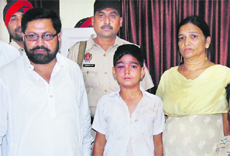 The minor has been handed over to his parents and a case of attempt to murder and kidnapping registered against the accused. 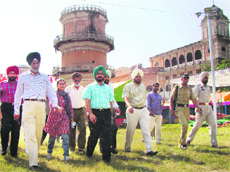 After reaching Faridkot, Chawla participated in a protest march and later staged a dharna. The protesters raised slogans against the police for allegedly trying to divert the people's attention by concocting stories that the victim had eloped. "I will raise the matter with the BJP leadership in Punjab and request them to send the party's women wing panel to Faridkot on October 12 to lend support for the district-level bandh… I will also be participating in the bandh and the case will be taken to a logical end," she said. Bhupinder Singh, member of the action committee formed to rescue the girl, said, "Instead of making efforts to release the girl and provide justice to the aggrieved family, the police is busy releasing her photographs and fictitious letters. By doing so, they are adding insult to the victim family's injury…. It's a bid to ostracise the victim socially." He alleged that by making such attempts, the police wanted to sabotage the October 12 protest. Two senior police officials had yesterday released several photographs of the 15-year-old abducted girl, which showed that she had "married after eloping with a boy". Bhupinder claimed that by releasing these photographs, the police had committed an offence under Section 228-A of IPC. Under this section, identity of a victim, where the girl is dead or minor or of unsound mind, cannot be disclosed by the police without authorisation in writing by the next of the victim, he said. Inspector General of Police Nirmal Singh Kahlon said the police was hopeful of arresting the accused and recovering the victim in the next five days. Kasif, who strayed into the Indian territory in November last year, was nabbed by the BSF in Fazilka area and sent to a juvenile home for entering India without any valid documents. Though on April 6 this year Kasif was absolved of all charges, he could not be repatriated as the Indian authorities had no clue about his parents in Pakistan. Moved at his plight, Faridkot District and Sessions Judge Archana Puri approached Pakistan’s theatre director Madiha Gauhar when she arrived here with her troupe on September 2. She sought her help in tracing the boy’s parents in Pakistan so that he could be repatriated. Gauhar met the boy at the juvenile home and spoke to him about his family in Pakistan. “On my return to Pakistan, I contacted a wide circle of friends to help me trace Kasif’s parents. A TV news channel also carried a report on the boy. And three days later, I was sitting with Kasif’s mother Kulsum Bibi. 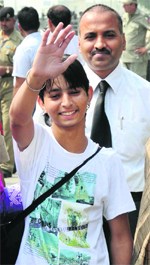 She talked to her son on my cell phone,” said Gauhar. This morning, Sessions Judge Puri travelled to Wagah along with Kasif and handed him over to his mother, who was accompanied by Gauhar. A resident of Depalpur in Okara district of Punjab in Pakistan, Kasif has five siblings. After his father died some years ago, his mother sent him to a madrassa, much to Kasif’s dislike. In September last year, he fled from the madrassa and strayed into Indian territory. “While at the juvenile home, a homesick Kasif was counselled by a psychiatrist many times,” said Ravi Bhagat, Deputy Commissioner, Faridkot. Gursharan Singh, General Manager (Industries), assured of action if anybody was caught flouting the norms. With four more gastroenteritis deaths today, the toll in this industrial town has risen to 10 even as officials are working round the clock to check the spread of the infection. Those who died at the Civil Hospital here today have been identified as Parkasho, Birbal, Som Nath and Tara Devi. The hospital has treated 20 patients so far while 30 more are still undergoing treatment, said Dr Sukhdeep Singh, Senior Medical Officer (SMO). Deputy Commissioner Abhinav Trikha, accompanied by Sub-Divisional Magistrate (SDM) JS Grewal and Municipal Committee Executive Officer Manjinder Singh Bandesha, visited the Gandhi Camp area in the morning. Chief Engineer of the Water Supply and Sanitation Department MS Dhaliwal also toured the affected area. Former Akali legislator LS Lodhinangal, who has been designated Batala halqa in charge, has reportedly rushed to Chandigarh to urge Chief Minister Parkash Singh Badal to announce compensation for the kin of the deceased. Batala Congress legislator Ashwani Sekhri claimed that the Central Government had given a grant of Rs 3.50 crore to the state for improving the town’s water supply facilities. “However, the government has not disbursed the grant that includes money for improving drinking water facilities in Gandhi Camp area,” he said. Senior Congress leader GS Charak and Raman Bahl and Youth Congress leader Nitin Sharma also visited the affected areas. Former Minister Master Mohan Lal said the state government should award a compensation of Rs 5 lakh each to the victims’ kin. A migrant labourer from Bihar died of diarrhoea while 40 more patients suffering from gastroenteritis were admitted to the district hospital here today.The disease has spread to the new grain market. Dr Naresh Gupta, Additional Civil Surgeon, said that Vinod Kumar (45), working in the grain market here, was brought dead to the hospital. He said three critically ill patients were referred to Guru Gobind Singh Medical College and Hospital while 50 others were undergoing treatment at the district hospital. “We have discharged 10 patients after treatment,” Dr Gupta said. 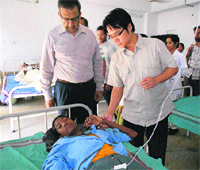 As many as 24 migrant labourers were admitted to the district hospital yesterday. They had arrived here from Bihar and Uttar Pradesh a few days ago for work at the local grain market during the procurement season. Sukhdev Singh of Badhni Kalan village and six labourers working at the Daroli Bhai village grain market had also been hospitalised, Dr Gupta said. He said stool samples of the patients had been sent to Faridkot. Additional Deputy Commissioner Joram Beda visited the hospital this morning and enquired about the condition of the patients undergoing treatment there. With the number of gastro patients rising by the hour, doctors at the Moga district hospital were on their toes throughout the day today even as the hospital ran short of beds.Two patients had to share a bed. A delegation of Congress leaders, led by party's state chief Capt Amarinder Singh, today visited Mandiala and Chatiwind villages in Attari constituency from where the case was reported. Congress Legislature Party leader Sunil Jhakar and 12 MLAs accompanied Amarinder. The Congress leaders also interacted with the villagers. Talking to mediapersons, Amarinder said, "A library and a community centre have been shown to have been constructed in Mandiala and Chattiwind villages, respectively. But, no such structures exist on the ground." "If (Parkash Singh) Badal fears a probe by the Central Bureau of Investigation, then he should entrust the inquiry to a sitting judge or a joint committee of the Assembly," Amarinder said. Jhakar said, "Ranike cannot say that he was not aware of his personal assistant's (Sarbdayal) wrongdoings. The fact that Sarbdayal continued to be his assistant even after the first FIR in the case was registered in June 2011 corroborates the Minister's involvement." As Ranike had remained Animal Husbandry, Dairy Farming and Fisheries Minister during the SAD-BJP government previous tenure, he should explain where was Rs 40 crore, received in 2011 alone, spent, Jhakar said. He said the ambit of inquiry should be widened to cover all border areas and not just Attari constituency. "Huge sums were siphoned off through fake sarpanches and panches," he claimed. Jhakar also demanded an inquiry into the disbursal of grants meant for post-matric scholarships for SC students amounting to Rs 58 crore in 2010-11 and Rs 50.96 crore in 2011-12. He alleged that Rs 68.65 crore meant for post matric scholarships for minority students in 2011-12 was also misused. The party's state leadership today geared up for AICC general secretary Rahul Gandhi's visit to Amritsar tomorrow. All sitting and former MLAs and MPs of the Congress, heads of District Congress Committees and block presidents from Punjab are likely to get an opportunity to interact with Rahul, who would be on a two-day visit to the state. Two separate venues have been decked up for senior and young Congress leaders to interact and exchange their views with the young scion of the Gandhi clan. Its co-chairman Jaiveer Shergill urged Rahul to take steps to bring the standard of schools in Punjab on par with Lawrence School, Sanawar, so that they too would attract the attention of Deputy Chief Minister Sukhbir Badal. Shergill said 97 per cent of students in the 18,397 government schools in the state belonged to Dalit families and 70 per cent parents of these children were illiterate.The infrastructure at these schools was in a shambles, he addded. Seeking the intervention of Union Railways Minister CP Joshi, Punjab Chief Minister Parkash Singh Badal today urged him to immediately start a Shatabdi Express train on the Bathinda-Delhi route via Jakhal-Rohtak to facilitate the people of the Malwa belt. In a letter to Joshi, the Chief Minister apprised him of the commissioning of Guru Gobind Singh Oil Refinery in Bathinda, following which the city had emerged as a petrochemical hub. He said the establishment of a prestigious Central University and a hotel management institute had further necessitated the sanctioning of the train on the route. He said the people of the region, especially the residents of Bathinda, had been demanding this train since long. The Chief Minister also informed Joshi that as people from other states, especially those in the Army and Air Force, frequently visited Bathinda since an Air Force station and Army cantonment is located there, the train would enable them a hassle-free journey to the city. Badal pointed out that as several people from the area had to go Delhi for boarding international flights, the train, therefore, was all the more important for them. In a statement here, SAD president Sukhbir Singh Badal said the decision was an anti-democratic exercise to scuttle the elections that were to be held before December 31 this year as per a court directive. 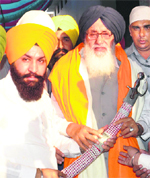 The SAD also termed the decision as direct interference by the Congress in the religious affairs of the Sikhs. The SAD president said the decision indicated that DSGMC president Paramjit Singh Sarna, fearing that his group would be wiped out in the elections, wanted to remain on the post by tweaking the law. Sukhbir said as DSGMC elections were being postponed by the Union Home Ministry on one plea or other, the Delhi High Court had to intervene and order the Home Ministry to hold these by December 31 this year. Now the Shiela Dikshit government had come to the rescue of the Sarna group to keep it in power “illegally,” he claimed. The SAD president said Chief Minister Parkash Singh Badal, SAD MPs and its NDA partners would soon call on the Prime Minister and the Union Home Minister urging them to stop this “mischief” and hold the DSGMC elections before December 31 as per the court order. He said the SAD would also organise a ‘dharna’ in New Delhi to expose the dubious role of the Congress in the “anti-Sikh” campaign. Sukhbir claimed that the Congress was playing vote bank politics by opposing the “ Peace Memorial” and raising the bogey of militancy to create a phobia among the Hindu voters. A party press note stated that Badal would discuss the issue at the party’s core group meeting and consult legal experts to chalk out the next course of action. He said an agency such as the CBI should thoroughly probe instances of heroin smuggling in rail cargo from Pakistan as these led to harassment of traders in whose consignment the contraband was recovered, despite the fact that they had nothing to do with it. He said yesterday’s seizure of heroin had alarmed the traders, some of whom had suggested a discussion on the viability of importing cement from Pakistan via the Attari-Wagah land route. However, he said they would wait and watch as to what action was taken by the authorities on both sides of the border to curb the menace of smuggling via the rail route. Indian importers had suspended cement import from Pakistan on August 4 after three incidents of heroin seizure in a similar fashion.The trade was resumed on September 3 after Pakistan started using metal seals in its rail wagons. Khanna Paper Mill managing director Suneet Kochhar said these instances had brought to the fore the need to do away with age-old modes of transporting goods. He said both India and Pakistan should ensure that adequate security measures were in place to facilitate hassle-free trade. A delegation of traders today met Customs officials and sought installation of scanners at the rail cargo facility. A spokesperson of the Confederation of International Chamber of Commerce and Industry (CICCI) said they would urge the Railways to strengthen security at its godowns and ensure a round-the-clock vigil. Besides, they would demand that the goods trains were escorted from Attari to Amritsar to prevent any mischief. They would also seek a sniffer dog squad. There have been reports of cheques having been forged by those close to ministers, say sources. A senior official in the Finance Department said that money would no more be sent through cheques. Funds would now be electronically transferred to the districts and then deposited in the accounts of the beneficiaries concerned. Earlier, funds through cheques were sent to the Deputy Commissioners and Additional Deputy Commissioners who would further give these to ministers for various works/schemes in their constituencies. “Under attack from various quarters for the alleged misappropriation of government funds by the personal assistant of a former minister, the government is in no mood to go soft on the issue,” said an official. Meanwhile, the Punjab Government has given the option to family pensioners employed in government service or re-employed in government service to either claim the benefit of travel concession (TC) or that of leave travel concession (LTC) available to government employees. An official spokesperson said the family pensioners could exercise the option within six months from the date of joining service or from the date of issuing of the letter, whichever was later. A departmental probe is on to ascertain why they were allowed home-cooked food inside the cell.The probe will also determine as to how they had managed to lay their hands on their case files. The inmates reportedly escaped after making a six-inch gap in the cell grill. However, their family members have rubbished the police claim. Pritpal Singh Thind, Superintendent of Police (D) said 245 kg of poppy husk was recovered from Karnail Singh, Joga Singh and Naresh Singh on Sunday. They were lodged inside a cell at the CIA police station. “They were allowed home-cooked food, which was brought by their family members. We suspect that a blade was supplied along with the meals”, he said, adding that the blade was used to cut the iron grills of the police cell. He said an insider’s hand could not be ruled out. More than 350 artists from 18 states will display their creations. As many as 160 stalls will be set up. 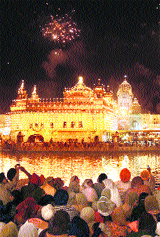 Though the mela will begin on October 11, Chief Minister Parkash Singh Badal will formally inaugurate it on October 12. Rural Development and Panchayats Minister Surjit Singh Rakhra said the event would provide an opportunity to poor artisans to showcase their talent. “The Central Government has given Rs 20 lakh for the event. The total expenditure will be around Rs 65 lakh. The rest will be funded by sponsorships and sale of tickets,” he said. ADC (Development) Anandita Mitra said the entry ticket would cost Rs 10, but government school students and children below the age of 10 would be allowed a free entry. Sources said board officials had recently conducted an exercise to identify such marriage palaces following directions of the Punjab and Haryana High Court. Environmental Engineer Manohar Lal said the defaulters had been served notices. The owners of defaulting marriage palaces had been told to reply within seven days or face action. The notices had been served under Section 25 of the Water Act 1974, Section 21 of the Air Act 1987, and under various provisions of the Noise Pollution Act, he said, adding the offenders had been discharging contaminated water without following prescribed method and throwing solid waste in the open, besides causing noise pollution by playing loud music. "The board will initiate proceedings for disconnecting power supply to those marriage palaces whose owners refuse to comply with the orders. The offenders may face sealing of their establishments," claimed Lal. A number of marriage palaces have come up in the region without obtaining change of land use (CLU), approval of building plans, permission from the Fire Safety Department, besides approvals from the PWD, Punjab Pollution Control Board, Power Corporation, Forest Department, District Town and Country Planning, Excise and Taxation and other departments. Sukhbir said the comprehensive policy would allow regularisation of marriage palaces after the owners satisfied conditions laid down in the policy. The policy laid emphasis on public convenience. It stressed on adequate parking arrangement by the marriage palaces. He said the policy had created a new category for marriage palaces as earlier these were clubbed under the commercial category. The policy would classify marriage palaces as per their location and size and mention detailed rates of change of land use, licence fee and other charges payable at regularisation. SAD leader Prem Singh Chandumajra had arranged the meeting in which officials of the Excise and Taxation Department were also present. Bharat Bhushan, president, Steel Chamber of Commerce, and Mohinder Pal, president, Induction Furnace Association, said they had apprised the Deputy Chief Minister of difficulties faced by them with the introduction of e-billing. They said they had suggested the government to withdraw VAT on the industry and instead levy a special tax per unit of electricity consumed by the units. "This way there will be no tax evasion and collection will be much easier. This tax may be named as local development tax to avoid the intervention of the Centre". 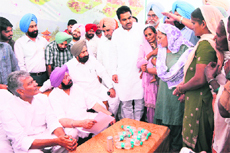 They said: "We have told Sukhbir that the government collects around Rs 680 crore as VAT. But it has to refund Rs 480 crore as a majority of the traders claim refund by opening bogus firms". They said the Deputy Chief Minister had assured them of looking into the matter. In its directions, the Punjab and Haryana High Court had asked the state government not to approve building plans in areas which are not approved colonies and stated that any violation would be viewed seriously. These directions of the High Court created panic, especially in Bathinda city, where there are 44 unauthorised colonies and more than 90 per cent of the area within the municipal limits has been declared unauthorised. The issue has its genesis in the 2008 list that the civic body submitted to the government mentioning the authorised and unauthorised colonies. Surprisingly, the old parts of the city, which have been inhabited for the last 100 years, too were added to the list of unauthorised colonies. "The authorising agencies came into being barely 15 to 20 years ago and hence, the areas that did not have any authorisation, were mentioned in the list. The irony is that most of the unauthorised areas have power, sewer and drinking water connections as well as road network. The list was faulty and our people are now bearing the brunt of it," said Senior Deputy Mayor Tarsem Goyal. With most building plans not being passed, people approached the Bathinda (Urban) MLA Sarup Chand Singla, who was present in today's meeting. Earlier, he had participated in the General House meeting immediately after being elected as an MLA. The residents alleged that they had been forced to take the step along with the schoolchildren after no official of the district administration or the Punjab Pollution Control Board heeded to their demand. The students carried placards questioning whether the government wanted "scholars or boozers"? They also invited the Chief Minister to visit the place and try standing amid the pungent smell. The residents and schoolchildren sat at different places on the highway in groups at a little distance from each other from 8 am to beyond noon. It was only after a naib tehsildar from Bathinda assured them of action that the blockade was lifted. Deputy Commissioner KK Yadav said he had told pollution Board officials to inspect the distillery and report the ground situation. Greenhouse farming has failed to take off in the district as only 12,000 sq m area has been covered under it till date despite 50 per cent subsidy provided by the state government under the National Horticulture Mission. Information from the Horticulture Department reveals only 12 greenhouse farms have been set up in various villages in the district. The main reason for this dull response is stated to be the absence of an assurance on the minimum support price by the government. The situation is, however, different in other districts like Nawanshahr and Patiala where a large number of farmers are reaping rich dividends by setting up greenhouse farms. District Horticulture Officer Rupinder Kaur Deol said the department had been holding regular camps to create awareness among the small and marginal farmers about the greenhouse farming. "The farmers are being told that they will get good returns within the first six months after setting up such farms. The initiative will also help in increasing the groundwater level," she said. Dr Deol said vegetables like coloured capsicum, cucumber, seedless tomato and zebra flowers could be grown in greenhouses. She said Rs 9.35 lakh was required to set up a farm covering 1,000 sq m and out of this, 50 per cent subsidy was provided by the department. The officer said the department had been telling the farmers to set up farms covering at least 4,000 sq m as this would help reduce input costs and boost profits. She said cooler-based greenhouses with fans and pads had been introduced recently which required a higher investment of Rs 14.65 lakh per 1,000 sq m. She said under the scheme, the government had distributed Rs 47 lakh as subsidy in 2010 while in 2011, Rs 14 lakh was given. 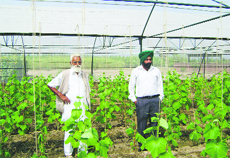 Sucha Singh Cheema, a progressive farmer of Badeenpur village, said after retiring from government service, he decided to set up a greenhouse on his 14 kanal agricultural land. He said no one took him seriously when he set up the farm four years ago. "Keeping in view the higher profits of Rs 1.5 lakh per 1000 sq m, a number of fellow villagers are now seeking my help to set up such farms," he added. The Chief Justice observed that there had to be some kind of mechanism to keep a check on private schools. The observations, however, were made verbally in an open courtroom and could not be interpreted as the court's final opinion in the matter. The hearing in the case was on for the last two days and after arguments by various parties, the Division Bench, comprising the Chief Justice and Justice RK Jain, today reserved their judgment. It is expected to be delivered in a few days. A counsel representing the Anti-Crime Investigation Cell of Ludhiana, the main petitioner in the case, argued that the lack of serious action on the part of the Punjab Government and affiliated school Boards the against alleged commercialisation and malpractices by unaided private schools in the state was a cause for concern. The counsel said while Haryana and Delhi had an education Act in place, Punjab lacked a statuary enactment regularising the working of these schools. He said that as by-laws of affiliation Boards were directive, and not mandatory, in nature, these education boards, therefore, failed to take stern against violations detected in private schools. He said there was need to have strong mandatory guidelines supervising their working. These arguments were in response to the interim order passed by the High Court in May, which said that no private unaided school under its jurisdiction would increase its fee without prior approval of the board. The decision was challenged by private schools in the Supreme Court. But, the apex court sent the case back to the court concerned and its hearing resumed on September 26. The counsel for private unaided schools of Haryana, Punjab and Chandigarh said that the schools were charging fee as per the facilities being provided by them and also quoted several Supreme Court judgments pleading that autonomy of private un-aided schools could not be taken away. The interim order also directed the affiliated boards to submit details on whether private schools were complying with the RTE Act. A Bench comprising Justices RM Lodha and AR Dave clarified that it was up to the state government to take action against the officers involved in the auction for not following the Licence Rules, 1956, and causing revenue loss. Senior counsel Mohan Jain, arguing for the respondent, contended that the re-auction had resulted in the liquor vends once again going to Ponty Chadha, the liquor baron from Uttar Pradesh. The HC had cancelled the auctions held on March 4, 2004, and ordered a re-auction. The officials then had conducted the re-auction fixing the minimum licence fee at Rs 75 per bottle, much lower than the amount (Rs 102 per bottle) fixed for the March 2004 auction. This had resulted in realisation of revenue much lower than the amount collected during the previous auction. The state government approached the SC once again, challenging the HC verdict. With the SC dismissing the appeal today, the HC order has attained finality under which the state government will have to return Rs 6.07 crore to Sanjeev Bhandari who had challenged the March 2004 auction. In the petition filed under Article 226/227 of the Constitution of India, Dr James has charged the CMCH management with ignoring his complaint of ragging of junior medical students which was brought to the notice of the principal and members of the governing body in a written complaint. Asserting that the authorities had failed to act on his complaint about ragging by senior medical students in the name of orientation in the hostel premises, Dr James alleged that when he intervened, the senior students too misbehaved with him. The CMCH authorities have been stating that Dr James was levelling these allegations because he was removed from the post of hostel warden. They also claimed that no junior student had lodged a complaint with them about ragging by seniors. The petition, which was heard by a Division Bench comprising Chief Justice AK Sikri and Justice RK Jain, has sought criminal or departmental action against Ladhar for collecting and retaining Rs 1.5 crore fixed as arbitration charges by him for conducting arbitration in various cases of disputes between private parties and the National Highway Authority of India (NHAI) regarding NH-1 and NH-1A. The petition has also sought that the entire amount collected by Ladhar for conducting the said proceedings be recovered from him with interest at the rate of 2 per cent per annum. The petitioner, local lawyer HC Arora, has submitted that while functioning as the arbitrator in his ex-officio capacity as Divisional Commissioner, Jalandhar, Ladhar fixed his arbitration fee per case and forced the private parties as well as the NHAI to pay the same by incorporating a clause in his orders that a certified copy of the orders be given to the parties on depositing the fee, failing which the orders would stand suspended after the expiry of 30 days. After the NHAI opposed the clause, Ladhar subsequently added another clause that the total amount of arbitration fee shall initially be paid by the private party, which could be recovered by the party from the NHAI along with the amount of compensation at the time of execution of the order. The petitioner also brought the court's attention to an order issued by Ladhar on March 4, 2009, which directed all the 629 private parties whose dispute was decided by him on January 28, 2009 by a common order, to pay the arbitration fee at the rate of Rs 4,100 per case to him. This amount added up to Rs 25.79 lakh. Under Rule 13 (8) of the All India Services (Conduct) Rules, no member of the All India Services, the PIL stated, can charge any fee for any work done by him for any private party or a public body without the permission of the government. However, Ladhar did not take any permission before fixing the fee or before collecting the same from private parties, the PIL claimed. Gurcharan Singh, who had surrendered five days ago, was produced in the court after the completion of his remand by the Vigilance Bureau this afternoon. The ACP had remained untraced for about 25 days after the registration of the case against him on the complaint of Ajay Goyal. Goyal had alleged that Gurcharan Singh, during his posting as DSP (Vigilance), Ludhiana, had taken Rs 25 lakh from him to favour Rajesh Gupta, a motor vehicle inspector, in an alleged corruption case against the latter. Rajpura SHO Bikramjit Singh Brar said the police had seized five motorcycles and a number of dismantled parts of various vehicles. "We are conducting raids to nab scrap dealers in the state and in Ambala who helped them dispose of the stolen vehicles," he said. The accused have been identified as Mahinder Singh, Parvesh Kumar, Gagandeep Singh and Amandeep Singh. A case under Sections 379, 411, 201 and 120-B of the IPC has been registered. “They are being questioned to ascertain the role of others involved in the racket and to know if they are involved in other crimes as well,” Brar added.